Our tree doctors, also called arborists, or certified tree experts make house calls. They are certified by the International Society of Aboriculture (ISA). Wherever your house or business in the Annapolis, MD area, they will come and evaluate your trees for any risks that might be there. That could be signs of disease or insect infestation, or it could be weak or damaged limbs caused by disease, wind or heavy snows. For your trees' protection and safety we can do a tree health evaluation to make sure it is healthy and will live a long time. 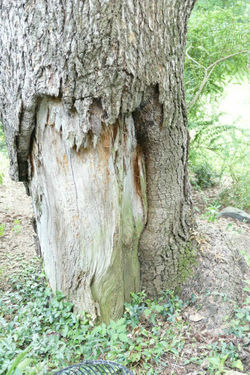 We can also do a tree risk assessment which can tell if there is danger to your house or the tree. It might need bracing, cabling or other solutions such as trimming. Trees can give a significant boost to property value, but they can be a liability and an expense just as easily. Most people want their trees to remain an asset and remain beautiful and we assume that you do as well. Please give us a call or fill out the form to schedule an appointment to evaluate your trees. ​Lightning strikes have been known to explode trees leaving sections and splinters. The pictures here are of two trees that were hit a number of years ago by the same bolt of lightning. It knocked out the tops of both trees and caused a section of the bark lower down to open up and left burn marks which have now faded. 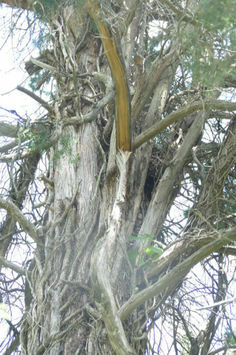 This can seriously weaken the tree, leave it more open to disease, and does not do much for the way it looks. We can basically set up a lightning rod in your bigger trees that will protect them from lightning strikes like the one that damaged these trees. Lightning is more likely to hit a larger tree, which is a problem. 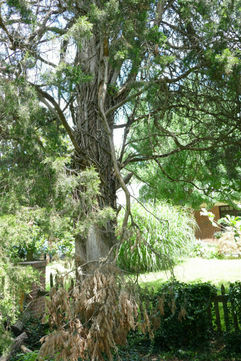 The larger trees provide the most shade, which can help with energy efficiency. They are also beautiful and increase the value of a property more than smaller trees do. And, if they are damaged or killed, they are much more expensive to take down. Finally, if they have to be replaced, the replacement tree will take years if not decades to get back to the same size. So call us to find out more about lightning protection for one or more of your trees. 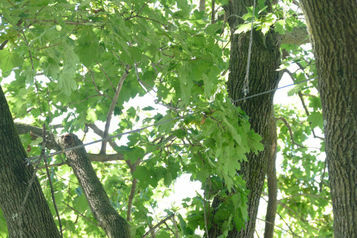 – As part of the Inspection Service, our arborist will determine if there are any branches that are particularly weak. In some cases this is easy to spot, but in other cases it takes a trained eye. The problem may be solved by pruning, but in other cases it is better to use tree cabling and bracing. 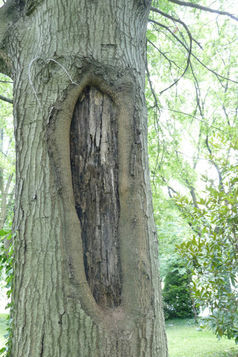 Trees that are particularly susceptible are ones that fork into two or more dominant trunks. If there are heavy snows, it is best to knock the snow off of your shrubs. This is particularly true for evergreen shrubs and bushes, especially brittle ones such as boxwood and Japanese holly. You can use your hands or take a snow shovel. Be careful though how you do it. Remember the branches are already bent from the weight of the snow. If you hit down on the branch you may break it. Use an upward motion to shake the snow off. Also, for smaller bushes, particularly boxwood and Japanese holly, be careful about just leaving them covered in snow. The snow hardens with time and as it melts and gets lower it can pull the branches down with it and do a lot of damage. Trees are too large to do this, so contact us before the winter and we can prune or cable susceptible branches. We have customers all around Annapolis, Maryland including Severna Park, Cape St. Clair, Riva, Mayo, Edgewater, Sherwood Forest and almost any other community you can think of in Anne Arundel County. 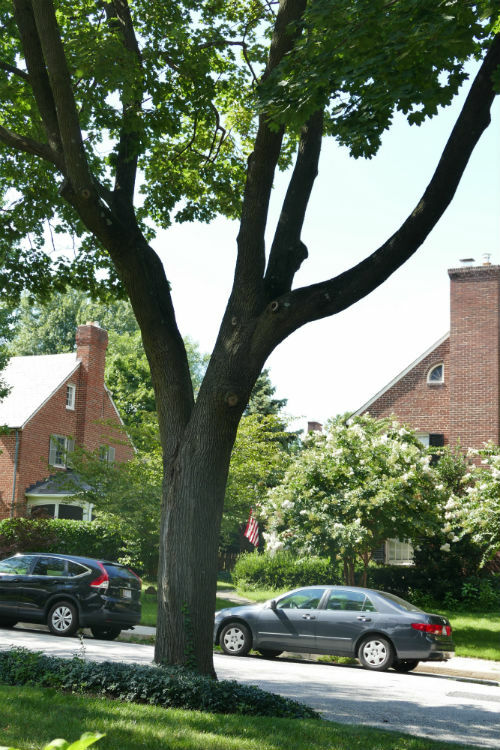 To find out more about our tree protection and safety services, fill out the form and someone will get back to you shortly or give us a call at 410-793-1013.